Today i am up 1.5 pounds from yesterday. Putting at my total weight loss at exactly 10 pounds in 16 days. That is not too shabby at all. I still have a white tongue and my mouth still feels fuzzy sometimes. I am sleeping well, but still not remembering my dreams. This is very odd since i usually remember them. My mind is still very unfocused so maybe that is part of the reason i am not remembering my dreams. I find that my energy is pretty even all day long. I am not getting suddenly sleepy in the middle of the day or crashing right after dinner. I wake up and have as much energy as i do an hour or 12 later. When i get tired, it is very sudden. I go from moving around and having tons of energy to being the walking dead on feet. Today, i have really been craving beans and rice wrapped in a fresh hot tortilla with tomatoes and a yummy salsa. It has been on my mind frequently today. I was also craving like crazy tomatoes today (i had 6 of them today), so i wonder if wanting beans and rice (where i eat 2 tomatoes typically) is symptom of my tomato craving. 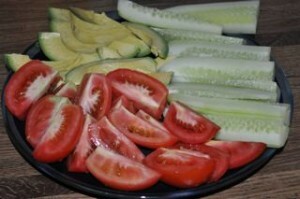 Except for my wild lust after tomatoes, today i was not very hungry most of the day. I woke up at 8am, and did not get hungry until 12:30. 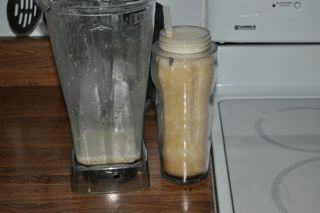 I had a banana smoothie with mesquite powder, maca powder, agarve, and ice. It was ok. i found i really missed the greens in it. About an hour after i finished that, i had a tomato and avocado plate with a cucumber. I then went and ran errands and my energy was great for the whole day. I got home after 7. I had some cantaloupe. Then an avocado tomato plate. This is when i noticed my tomato craving. Normally, i eat this and i feel great. This time, i felt great, but i really wanted more tomato. So i made myself another tomato. Then another. Then, i finally felt full. Weirdly, about an hour later, i got a strong craving for grapes around 9:30. I dont typically eat that late, but i had a bowl of grapes, and it felt wonderful. I’m so tired and have so little focus at the moment that I can’t even remember what I wrote yesterday. I didn’t have any smoothies today. I did increase the amount of oranges I ate and got to have pineapple for the first time since we started this. My stomach was okay with this, but I did miss my smoothie. I’m still seeing benefits continue to show: weight loss, clearer skin, etc. This is fine by me. I am still looking for patterns between what I eat and how I feel. This entry was posted on Tuesday, March 17th, 2009 at 3:10 am	and is filed under Raw Food. You can follow any responses to this entry through the RSS 2.0 feed. You can leave a response, or trackback from your own site.